This product is temporarily unavailable. Please contact us for further information, and we can keep you updated. DeGerminator is a 100% natural, ready to use enzymatic and organic acid ferment, which is able to sufficiently degrade the protective coating on weed seeds which prevents them from attaining a viable germination. It is a natural altnernative to chemical use. It is to be used immediately post harvest and applied to the windrow area and stubble spread broadacre. It can be used as often as necessary in this way to achieve results. 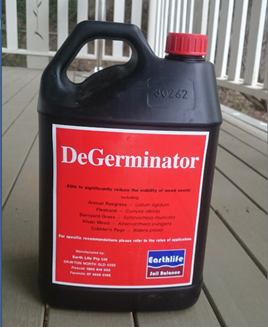 DeGerminator works in all weather conditions, doesn't harm living plants or harm live stock. Minimum application volume; 100 Lt per hectare. Water used in application must be pH range 6.5 – 7.0. Adjust if necessary before the addition of DeGerminator. Ensure not to add a wetting agent or mix with other herbicides.